Why Don’t Girls Get Action Figures, Too? 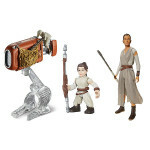 You are here: Home › Why Don’t Girls Get Action Figures, Too? Antiquated gender marketing may be missing out on important opportunities and limiting our children’s play and career opportunities. Some toy companies, like Hasbro, have made progress in the toy industry by ending gender categories. But why does gender-based toy marketing still exist? Have we really made as much progress as we’ve thought? And are girls missing out on the ‘action’? Let’s take a brief look at some of the newest toys hitting store shelves. With the new Wonder Woman movie set to hit theaters in June 2017, fans can expect Wonder Woman toys and merchandise to hit store shelves. 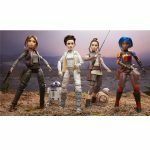 Star Wars Forces of Destiny Adventure Figures will feature six leading heroines, including Rey, from the animated shorts plus key Star Wars characters. LEGO announced minifigures celebrating Women in NASA, and DC Super Hero Girls – superhero action dolls – was awarded the Action Figure Toy of the Year Award at the New York Toy Fair. On the surface it seems girls are finally getting in on the action, so to speak. But is our social evolution pervasive in the toy industry? And is the focus on action for girls an ongoing problem? From a cultural standpoint, we are ingrained with the gender stereotypes of dolls being for girls and action figures for boys and marketers embrace and promote these very antiquated ideas. But, in fact, dolls and action figures are at their very core the very same toy! Think about that for second. Even Oxford’s dictionary defines an action figure as a doll embodying a character typically engaging in intense activity, such as a toy soldier or superhero. So apparently Horse Riding Barbie doesn’t fit into the action figure category even though an action figure is clearly defined as a doll. In 1964 with the launch of G.I. Joe, Hasbro created what we now know to be the action figure category. It was Hasbro’s attempt at replicating Mattel’s Barbie doll success. Barbie dolls were targeted toward girls, but Hasbro wanted a means to clearly differentiate G.I. Joe from a doll. It was at this point the division between dolls began with big, muscular, aggressive characters in one corner and fashion and beauty dolls in the other. The toy industry has long been criticized for toy designs that are either overly masculine or feminine when compared with reality. We’ve all heard the discussions of unrealistic body shapes for girls as was the case with Barbie for many years until recently with new body types for Barbie. And, more recently, increased masculinity of male toys has been linked to boys’ anxiety over body image. What’s somewhat troubling is that there is no concrete definition of the variance between dolls and action figures. It brings us back to the fact that action figures are dolls by definition. Why do toy companies dislike calling an action figure a doll? Do toy companies innately believe that boys would think less of the toy because it was called a doll? Could it be sexist ideas at play from head honchos? Thankfully, a few companies are beginning to shift their thinking. 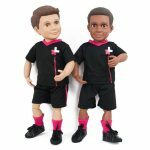 Case in point: Wonder Crew Superhero Will Action Doll, which combines action figures with dolls, and BoyStory Boy Action Dolls. DC Super Hero Girls won the 2017 Action Figure Toy of the Year award and many believe this represents a step forward for the industry. 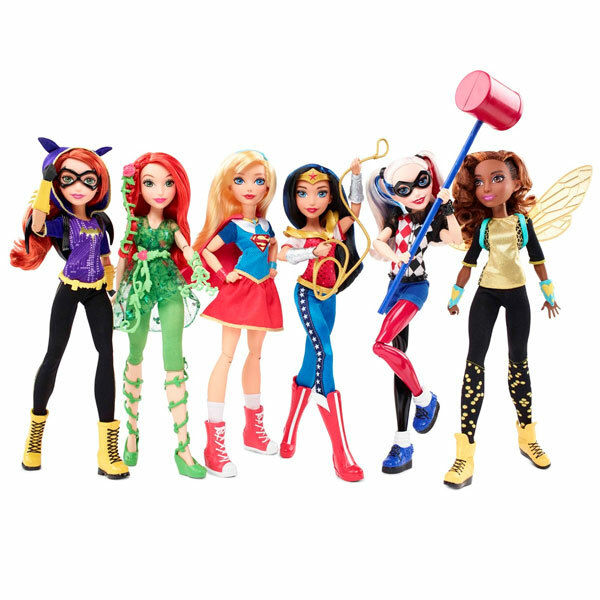 The problem is that these superhero action dolls are designed and marketed for girls and sold in the fashion dolls category by retailers. But, wait, toys like Batman and other superhero toys are supposedly called action figures. So what gives with the miscategorization? Both boys and girls should be able to play with Supergirl, Batgirl, Wonder Woman, Poison Ivy, and Harley Quinn if they want to and nothing should prevent them from doing so. Clearly, examining the bigger picture, the long-standing divide between boys and girls and action figures and dolls is still very much present. Most likely, the LEGO Women of NASA set will be deemed to be for girls by many. Children’s interests can very likely be similar and sometimes you cannot simply say with certainty that this is a boy’s toy or that is a girl’s toy. Doing so would limit a child’s opportunities to play something that could potentially spark their interest. Nowadays many people accept boys playing with dolls and girls playing with action figures. In fact, there was at least one instance of a boy who loved watching My Little Pony and playing with the toys and his mother didn’t care what others thought as long as her son was happy. Why can’t a boy freely play with ponies? This shouldn’t be as big a deal as it is now. So wouldn’t it be advisable to have a broad doll category encompassing action figures? A shift in marketing and communication could certainly make a huge impact. 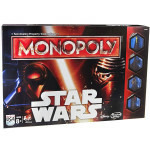 Toy makers like Hasbro have announced ceasing gender categories as have major big box retailers like Target. However, gender-based marketing of pink and blue is still widely prevalent. Take, for example, Lego Friends – which is separated from the other LEGO and action figures. Can you envision a future with a toy aisle stocked with different dolls – fashion dolls, beauty dolls, and action figures? There would be no gender divisions and definitely no pink and fluffy versus dark and angry divisions. What you would end up with would be an aisle full of variety, color, and a wide assortment to choose from. What are the ramifications of such a fundamental shift in thinking? First, boys may not be embarrassed to explore the doll aisle. Similarly, girls could discover new interest in superheroes. Which kid doesn’t dream of being a superhero?! From a business perspective, these represent new opportunities to fuel growth for the industry. The unrealistic body shapes may also come to light for toy creators, resulting in improved designs that are not as extreme. Scenarios where female characters like Rey and Black Window being mysteriously left out could be a thing of the past. Just look at how well Rey Star Wars toys sold once they were released! Both boys and girls alike enjoyed playing with them. The reality is the only real difference between dolls and action figures is one created by marketers. 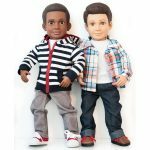 Dolls are targeted toward girls while action figures are targeted toward boys. The marketing strategy built in the 1960s is fundamentally flawed at its core because it assumes boys and girls play in significantly different ways and there is no overlap whatsoever. But with such a flawed line of thinking, gender inequality thrives. In essence, toy companies are limiting what our boys and girls can and cannot play with as well as their business opportunities. And our children may be missing out on critical play patterns as a result. However, creating action toys for girls is more of a lateral move than real progress. At its core, it still says that boys and girls are very different when it fact they could have overlapping interests. It also could be the reason why we have a shortage of women going into STEM careers. True forward progress would mark the end of gender-based marketing and distribution. It’s time we demand action and promote gender equality in the world of toys!